Experience the excitement of the Thai capital. See the River Kwai, the vast serenity of Angkor Wat, and the palaces and museums of Phnom Penh. You'll also drift through the exquisite waterways of the Mekong Delta to the former Ho Chi Minh City - formerly and famously Saigon - on this wonderful tour. British citizens require machine-readable passports when travelling overseas. A visa is required for entry to Cambodia. Your passport must contain two blank pages and be valid for six months beyond the exit date from Cambodia. The current charge for British Citizens is £25. British Citizens do not require a visa to visit Thailand. Until 30 June 2017, British Citizens do not require a visa for single entry visits to Vietnam if staying for less than 15 days. If travelling to Vietnam after 1 July 2017, a visa will be required, and the current charge for British Citizens is £54. Full details of how and when to apply will be sent out about eight weeks before your departure date. *Low deposit of £50 applies to new bookings made between 1st and 30th September 2016 (inclusive) only. This offer only applies to all 2016 to 2018 air breaks excluding the American Queen - Mississippi River Cruise; Deep South Rhythms, New Orleans and Caribbean Cruise; Five-Star Alaska Cruise and the Canadian Rockies; Highlights of China and Yangtze Cruise; Any world cruises or sectors aboard Magellan that include flights; Cruises aboard Norwegian Star that include flights; Cruises aboard Mendula that include flights; Cruises aboard Astoria that include flights; Cruises aboard Olympia that include flights; Cruises aboard Sound of Music that include flights and Daniel O'Donnell in Dublin by Air. This offer is subject to availability and may be withdrawn at any time. Discover an authentic taste of Thailand and enjoy a colourful display of traditional dancing at an evening dinner that will really bring local Thai culture to life. Join what for many will be the most poignant highlight of the holiday, our River Kwai and the ‘Death Railway’ excursion. Take the train to Nam Tok Sai Yok Noi, following the infamous route through the jungle where thousands of Allied soldiers lost their lives. Lunch will be served, and there will be a chance to visit the various museums connected with this area’s tragic history. Experience the colour and bustle of the vibrant floating markets of Damnoen Saduak where local Thais buy and sell fresh fruit and vegetables from their boats, then recover from that whirl of energy at with a visit to the Rose Garden, where a traditional Thai village is set out amid 70 acres of tropical gardens. Enjoy the displays of aspects of traditional Thai culture, from boxing and dancing to working with elephants. Centrally located, this hotel boasts a large swimming pool terrace and several bars and restaurants. Guest rooms are well-appointed, and have air conditioning and tea- and coffee-making facilities. A modern, centrally located hotel with a restaurant and an outdoor swimming pool. Your room will have air conditioning, TV, a mini-bar, and tea- and coffee-making facilities. This modern hotel, located close to Ben Thanh Market in the centre of the city, has a rooftop swimming pool, a fitness centre, a bar and a choice of restaurants including a cafe, a poolside bar and an Asian restaurant. The guest rooms are decorated in a contemporary style. Your holiday begins with an overnight flight to Bangkok. An afternoon's guided city tour starts on Rattanakosin Island, the 'royal island' on the bank of the river Kwai where the Grand Palace adjoins the Wat Phra Kaeo temple. The Wat Pho temple's gigantic reclining Buddha and the five-and-a-half ton Golden Buddha at Wat Traimit temple are among the highlights. In the evening, you'll have the option to join your fellow travellers for a traditional Thai Dinner with Dance excursion to celebrate the first of your three nights in the city. Discover Bangkok at your own pace, relax in your hotel, or join our optional excursion to the famous River Kwai. During this revealing trip you'll pass through rice fields and sugar-cane plantations, then head into the jungle. There, you'll be able to explore an area forever associated with the events of WWII, the construction of the 'Death Railway' and the infamous Bridge immortalised by the epic 1957 film. Take advantage of the morning's insightful optional excursion and you'll see the unique floating markets at Damnoen Saduak, and visit the 70-acre Rose Garden. Here,in the surrounds of a traditional Thai village, you can witness displays of Thai culture, the national sport of Muay Thai (Thai boxing) and folk dancing. You'll have an early start, to make the most of the day, this morning, journeying through the unspoilt rural landscape to the border where you'll cross into Cambodia at Aranyaprathet-Poipet. Formalities completed, you'll begin the second part of your adventure with the short journey to Battambang, an elegant French colonial city. Journey across Tonle Sap, South East Asia's 'Great Lake', and see the villages built entirely on stilts that are home to the 'floating communities' whose livelihoods depend on its waters. By mid afternoon you'll arrive in the colourful market town of Siem Reap, gateway to the temple complex of Angkor Thom and home to the archaeological Angkor National Museum. In the evening, you can enjoy a traditional Cambodian dance show during dinner. On the seventh day of your tour, you'll visit the Bayon temple, with its four giant heads and countless faces carved into the rock. Another unforgettable highlight is the 'lost city' of Angkor Thom: the great citadel of the Khmer Empire, which ruled up to half of South East Asia for nearly 600 years. 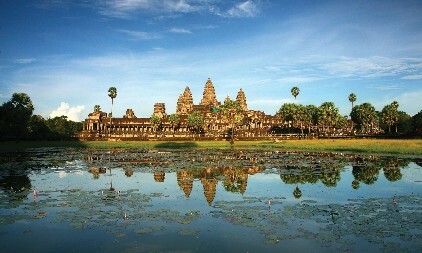 The most imposing and impressive of the great ruins is Angkor Wat. This is the world's largest religious building, and incorporates five great towers as well as a 1000-metre-long carved bas-relief. Another day of exploration takes in the temples of Hariharalaya, plus the smaller temples of Banteay Srei and Banteay Samre, with its reliefs depicting Krishna legends. Travel to the evocative Cambodian capital of Phnom Penh, set on the banks of the Mekong River, where you'll take an afternoon's guided tour that includes The Royal Palace, with its Silver Pagoda of priceless Buddhist artefacts. Your evening dinner will be at the famous, riverside Foreign Correspondents' Club. Experience a thought-provoking morning visit to the Tuol Sleng Museum, which chronicles the Pol Pot years and the reign of the Khmer Rouge. This is followed by the opportunity to take a good look around Cambodia's National Museum, the country's largest cultural, historical and archaeological museum. You'll then board the fast boat for the thrilling wind-in-the-hair journey along the Mekong River into Vietnam, arriving at your overnight hotel in the border town of Chau Doc. Your day begins with a visit to the holy mountain of Nui Sam. Featuring pagodas and temples, the mountain provides stunning views over the Mekong Delta, which you'll be heading towards. You'll stay overnight in the university town of Can Tho, with its colourful floating markets, busy, working harbour and sacred Khmer pagoda: Muniwangsyaram. Brilliantly coloured orchards, lush forests and traditional rice fields criss-crossed by a network of small tributaries: this is the unmistakable landscape of the Mekong Delta. And you'll be there, enjoying a boat ride through the floating markets of both Cai Rang and Cai Be. You'll also get to see the Delta town of Vinh Long. Come the evening, you'll arrive in Ho Chi Minh City for a two-night stay.